This time we’re in the northwest of France, enjoying Normandy — friendly locals, crêpes, Camembert, and a port town known as HONFLEUR. It is a popular get-away for Parisians. Little did we know that by not booking ahead, and it being the special “Blessing of the Ships – Pentecost weekend” – that we would not find a room – anywhere. 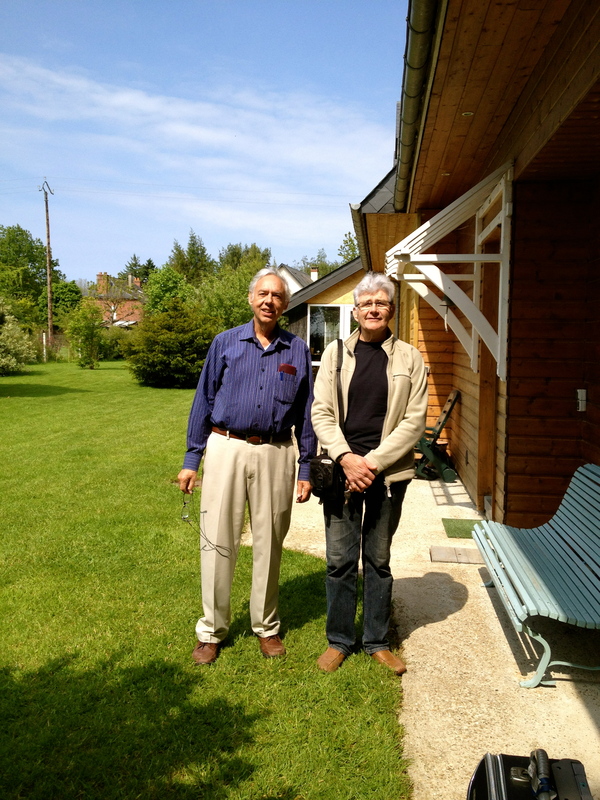 And then, when we thought – must we go all the way back to Paris, or sleep on a park bench – when this tall gentleman comes out of NO-WHERE and asks us if we need a place to stay ………. We’re listening to him, and looking at him, and then I’m glancing at David and thinking that this is just TOO weird, who IS this person coming to us out of no-where? My American skepticism kicks in and I think ‘“SERIAL KILLER”………..do not follow this person. Well, we exchange niceties, and his card is given to us, a very nice little itsby bitsy card- the smallest little card – almost a brochure actually, but TINY , that you’ve ever seen. We put it away and go to our first hotel, the one that is always there for us with an airline discount, – MERCURE, but ofcourse, they’re full, just like we’ve already been told. We call 6 other numbers that we had listed in our fones. It’s a very short conversation and it’s all C’est complete” – full. Okay, so we go back to Mercure and ask them about their other hotel in Le Havre across the river. Oh, okay, they do have one room, but it’s 170 euros!!! Oh dear God. Then we ask about getting there, and it’s by taxi. How much is that? 70 euros!!! You have GOT to be kidding me. The park bench looks more inviting. We’d only need it for maybe a couple of hours as we could stay in a restaurant eating and drinking till -what? at least 3am? I don’t know. But it’s looking grim. We look at each other and pull out the itsy bitsy colored “brochure” of this GITE (by our stranger,) and call the number. Yes , he still has the room, and so we tell him we’re be arriving by taxi. It’s only 6 km away. The taxi that we had called earlier is nowhere to be found…….this always happens to us. So, we called the stranger back. He says he will come and get us. And then he arrived in a little van/truck with only 2 seats in it so David gets in the back with no seat and I get in front with this nice stranger ……. I do have a lot of faith in these matters, by traveling “by the seat of our pants” so to speak because that is our M.O. with our work, but honestly, it’s a test, and honestly, this guy comes out of no- where and we are blessed blessed blessed with the most lovely evening in this gorgeous Gite in the Country outside Honfleur, quiet, peaceful, with a long country walk in the morning after our very fresh country breakfast. 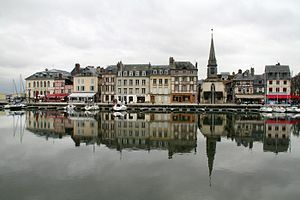 The following is compiled from Wikipedia and from Rick Steve’s Travel to Honfleur………..
Honfleur escaped the bombs of World War II and feels as picturesque as it looks. Gazing at its snug harbor, it’s easy to overlook the historic importance of this port. This is where the Seine River meets the English Channel. For over a thousand years, sailors have enjoyed Honfleur’s ideal location. While busy conquering England, William received supplies shipped from here. (Also a relative, btw). And Canadians know Honfleur for Samuel de Champlain who sailed from here in 1608, discovering the St. Lawrence Seaway and founding Quebec City. The harbor, once fortified with a wall and two gates, is now an easy-going marina. Today’s Honfleur, long eclipsed by the gargantuan port of Le Havre [luh ah-vrah] just across the Seine, happily uses its past as a bar stool and sits on it. Honfleur’s Church of St. Catherine is worth a visit. It seems if you flipped it, it would float. That’s because it was built by a community with plenty of boat builders and no cathedral architects. When the first nave was built in the mid-1400s, it was immediately apparent they needed more space — so they built another. Many consider Honfleur the birthplace of Impressionism. Just as Monet once did, artists still come here catch the light playing on the harbor front and reflecting in the water. It was in places like this that the battle cry of the Impressionists — “Out of the studio and into the light!” — was born. Very large – & Christian is so nice!!! ( not a serial killer in the least)!! and sooooooooo nice…….we love his place. COME!!! Wow, Marti, what a great experience. That gite looks amazing. I may be in touch to get the contact information from your serial kill … euh … host for our next getaway!